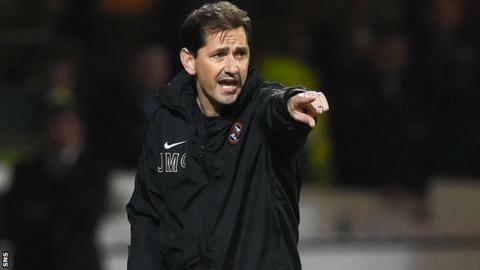 Dundee United boss Jackie McNamara wants to see an extended elite league in Scotland. McNamara says there are enough clubs to make a 16 to 18-team Scottish Premiership work effectively. There are currently 12 sides in the top league. "We have enough good teams in the Championship to extend the [top] league and make it more exciting," he said. "Some countries only play 30 games a season and we've played Celtic seven times this season." Dundee United met Celtic in both domestic cup competitions, one of which went to a replay. Scottish football underwent a restructuring process in 2013, with the Scottish Premier League and Scottish Football League merging to form the Scottish Professional Football League. The league structure remained as a top flight of 12 and three lower divisions of 10, but play-offs between the top and second tier league were introduced. McNamara added: "It's shown in even the cup games - there are Championship teams in the semi-final [of the Scottish Cup] tomorrow. "You look at the league this year and Aberdeen haven't managed to beat Celtic, but they've managed to hang in there by beating everybody else. "Regardless of what's happened in the last few years with all the clubs, it's a chance to extend the leagues. [With] the players are out there, the teams are out there, given the chance I think it would be better for everyone." He added: "You could make the league cup a two-legged affair; home and away. There's a lot of things that can be done to make it more attractive, to make it better for the fans and more competitive. "You've seen that this season with Aberdeen and Celtic; if you only play them twice, it changes everything because they've held their own against everybody else in the league and it would make it more exciting for the finish."